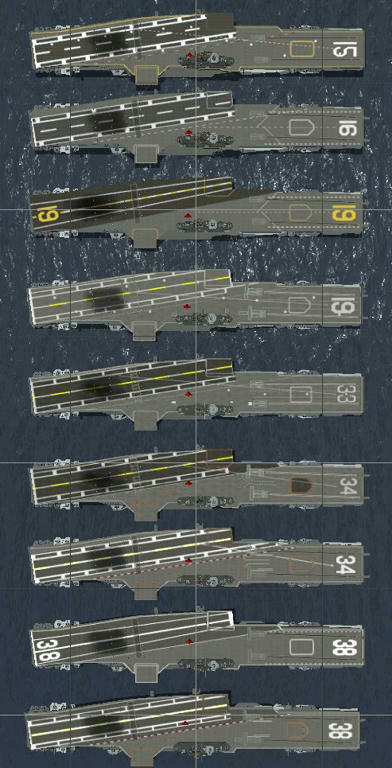 USS Essex class aircraft carrier after SCB-125 modernization with angled deck. This MOD original 3D and armaments are made by Diving_Hawk. This pack needs Ship Extention 2.11 http://www.sas1946.com/main/index.php/topic,18742.0.html for full functions. UP3RC4 isn't compatible to Ship Extention 2.11, in limited functions (without rotating radars) you can use this pack in UP3RC4. And this Essex SCB-125 has Catapults , latest version SAS Engine MOD needed. For only UP3.0RC4 , use this Catapult MOD. Only UP3RC4 is 27th Dec. 2011 version is latest and some functions limited. 2. You have to taxi you airplane from spawning point to the catapult starting point and push "Toggle Chocks" key, then airplane will be set on the Catapult. After you make full-throttle, push "Toggle Chocks" key again, the catapult pushes your aircraft to take-off. 3. When you enable "Carrier Take-off MOD", AI airplanes jump to the catapult starting point, not taxi. As olways you are a great , rugged and appreciated shipyard!!! Fantastic work Western – thanks very much. Was a bit daunted by the scale of this mod – but pretty straight forward installation. Your instructions are very good – considering you do not speak English & use a translator. Really nice, thank you . 1. Do the SAMs on the bridge area actualy work at the moment? Do they require any aditional mods to work? Is there a maximum target's aproach speed? Bc I made a mission with a squad of MiG-17s aproaching USS Essex late (1965) and they didn't fire even once. EDIT: Note I have installed ShipExt 2.10, AI, Engines and Hotkeys v2.5 and Carrier TO mod v 5.7.2 but it didn't change anything to the above. Essex class didn't have any SAMs. So, this MOD Essex ships don't have SAMs. DBW1.71 has this class catapult codes. But because of a bug , those codes don't work. And this Essex SCB-125 has Catapults , but they work on only this new Catapult MOD. http://www.sas1946.com/main/index.php/topic,23327.0.html (DBW1.71 / SASModAct3 with Jetwar ver1.2). 1. So, what are those things at the frontal and back side of the bridge? I noticed they turn into enemies' direction when they aproach. BTW, are you sure that late (1970) of them didn't have SAMs? 2. Read edit: I installed it but it didn't help - those that worked work, and those that didn't don't work. The things at the frontal and back side of the bridge are AAA targeting room. They are not new ones, I think. Basic rooms are WWII time ones with new antennas. Daidalos Essex/Intrepid have similer ones. 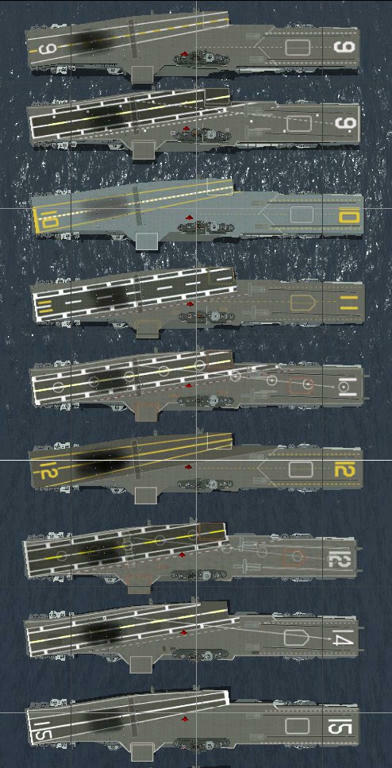 Hornet and Bennington as CVS, Lexngton as AVT, Bon Homme Richard and Oriskany as CV, all had no SAMs. Coral Sea didn't have, too. Midway or Forrestal class had Sea Sparrows. Served onboard Oriskany '63-'65. Only thing we had... eight -5" 38s. Later, in dry dock in, Bremerton,Wa, four were removed. Served onboard America '66 - '67, as I remember, she had missiles.